The second Brazilian jiu jitsu lesson that I ever took was with a highly successful female black belt from Rio. Most of us in the small women's-only class were brand new white belts still flailing toward our first stripe at the time, so she focused on self-defense. Around the third variation of a choke defense, my classmates and I started to notice a pattern in the way she was setting up the moves: they all involved a hypothetical police officer attacking us. It wasn't a somber class by any means. Every time she'd demonstrate getting choked, she'd laugh and add "And then you say 'Not guilty!'" And then she had us add that touch to our own practice with the moves. Get choked. Giggle "Not guilty!" while waving your hands in the air. Execute the move. Repeat. And it wasn't like she added this bit to give us a heavy-handed lesson on police brutality and wrongful arrest. For her, that was just an inextricable part of the self-defense foundations of BJJ. I'm not arrogant enough to think that I'm even half as good at writing as this instructor continues to be at BJJ, but I do feel a certain kinship with her when I find myself slipping in the literary equivalent of her "Not guilty!" jokes in my work. For as long as I've been writing about culture—on screen, in print, in clubs, online, or within a sanctioned fighting enclosure—I've been receiving complaints about the political content of my work. On some level, I suppose that I understand the frustration. Especially now. We're all exhausted by the current political climate and the way that it spills into our professional and personal lives. We all need a break from that, somewhere we can turn to recharge and spend a few minutes thinking about anything but the existential barrel of the gun that the entire world is staring down. But here's what the complainers don't get about me: I don't bring politics to my writing out of an agenda or some secret desire to ruin dudes' fun by getting social justice germs all over their favorite things. And here's what they don't get about fighting: for the rest of us, those politics are already there. We're only commenting on what we're actually seeing and experiencing. In fighting, this is true for me on both an individual and societal level. Personally, I know what it's like to be the only woman on the mats (and I also know what it's like to have the owner of a gym tell you to quit your job because it makes the gym look bad while your male teammates get to do whatever they want). I've experienced sexism firsthand as both a very low level BJJ competitor and a writer. I've watched my trans teammates face both transphobia and imperfect allyship from the fight community. I have friends who will only watch fights from the safety of their own homes because they've been harassed at live events and even at bars broadcasting pay per views. On a larger scale, I find it impossible to ignore the role that politics has always played in combat from their very inception—would we even have martial arts without political conflict?—to the ways in which racism, sexism, homophobia, transphobia, anti-war activism, and any and all intersection of those issues of the day play out in rings and on mats just as much as they play out in the rest of our lives. To ask that any of this be removed from fight culture is, in of itself, a political stance. It takes a certain amount of privilege to be able to ignore the politics inherent in fight culture. It means you've been able to participate in fights or even watch fights and not have to worry about your safety beyond the injuries you can sustain in training and competition. It means that you've always been able to see people who look like you and assume that the reason that you're not seeing other people is because they were uninterested—not because there are other reasons that might be keeping them away. It means that, when they do have the guts to show up, you can dismiss them as having an agenda beyond fighting for a chance to participate in fights the way you've always been able to. It means that you've never even paused to consider any of this before. To ask that people shut up about these things so that you can continue to enjoy your apolitical fun takes an active desire to protect and perpetuate that privilege. It's also a gross misunderstanding of the cultural legacy of combat sports and the current issues that face them. We can't comprehensively talk about Jack Johnson's legacy without bringing up white supremacy. 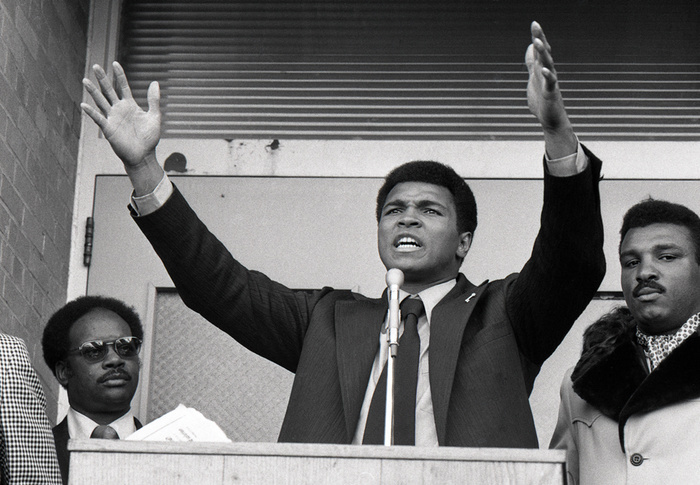 We can't do justice to the incredible impact that Muhammad Ali made in sports and culture without talking about racism, Islamophobia, the Vietnam War, and conscientious objection. We can't talk about the rise of women's MMA without at least trying to pick apart the criticism that incredibly flawed figures like Ronda Rousey and Cris Cyborg deserve from the sexist bile that's been thrown their way for daring to be women who fight at all—or without keeping an eye on the way that pretty white women have been promoted and endorsed over their counterparts in the sport. We can't even discuss the present and future of combat sports without bringing up the Trump regime, because their policies have a direct impact on both the present and future of fighting. The travel ban is already threatening to change who can fight and where. Drastic alterations to health care have the potential to change the demographic of an entire generation of fighters, because it will dictate who can and can't afford to risk injury in the early days of their training. Fighting, as so many of us often argue, is the best and worst of life laid bare. Ignoring any issues that might be related to that basic, essential truth—and arguing that other people should stop talking about them so you can just enjoy yourself—cheats both the culture and yourself. Sure, you could try to pretend that all of this is really just about two men punching each other in the face. But why would you want to when combat, in all of its messy physical and metaphysical glory, is so much more than that?